Claude Bernard, a French physiologist who died in 1878 and originally wanted to be a playwright, said, "A fact in itself is nothing. It is valuable only for the idea attached to it, or for the proof that it furnishes." At the bridge table, it is a good idea to get maximum mileage out of your valuable cards. In this deal, how should South plan the play in four hearts after East takes two club tricks, then shifts to the diamond king? East has an awkward hand. I would open one club and rebid one no-trump over a one-heart response, hoping not to miss a game. South's three-heart overcall showed a seven-card suit and 6 to 10 points. West's hand was too weak for a negative double at that level. And North bid what he hoped his partner could make. South starts with four losers: two diamonds and two clubs. He has only nine winners: one spade, seven hearts and one diamond. He must establish a second spade winner. That means ruffing three spades in the South hand, which requires four dummy entries: three for the ruffs and one to get back to the dummy to cash the new winner. These must be the spade ace and all three invaluable trumps. Declarer wins with dummy's diamond ace, cashes the spade ace, ruffs a spade in his hand, returns to dummy with a heart to the seven, ruffs another spade, crosses to dummy with a trump to the 10, and ruffs a third spade. 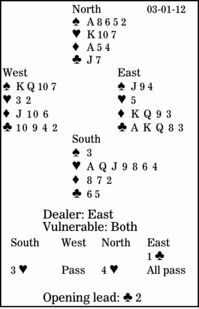 Finally, South plays a heart to dummy's king and cashes the spade eight, discarding a diamond and proving he is a good player.